PRO TIP! What ‘temperature’ lightbulbs you use can drastically impact how a color looks in your home. Do your light bulbs cast more of a warm, orange glow or do they have a cooler light? The best way to get a TRUE representation of the paint colors you’re selecting is to use bulbs that are close to 3000K (kelvin). Often times, this is categorized as ‘warm white’ in the store if it doesn’t provide a kelvin temperature on the packaging. 3000K is as close as you can get to the temperature of outdoor light meaning it’s not going to turn your gray walls beige or blue. A lot of times LED bulbs will be really cool in temperature while those vintage Edison bulbs are very orange. Be aware of how your lightbulbs are affecting the perception of your paint choices. Coventry gray is the perfect place to start. It’s a versatile mid-tone gray that easily pairs with most colors. See below for a variety of spaces using this color. Here you can see how the Coventry Gray wall color pairs beautifully with the warmer tones of the brick, door, and flooring. On the ceiling is Chelsea Gray which we will cover later! Coventry Gray is a great selection for this space because it contrasts nicely with the white trim but it’s light enough that this hallway doesn’t feel dark. Coventry Gray is neutral enough that it can easily be paired with bright pops of color. You can see that Coventry Gray pairs well with warmer tones, cooler tones, bright whites, and pops of bold colors! 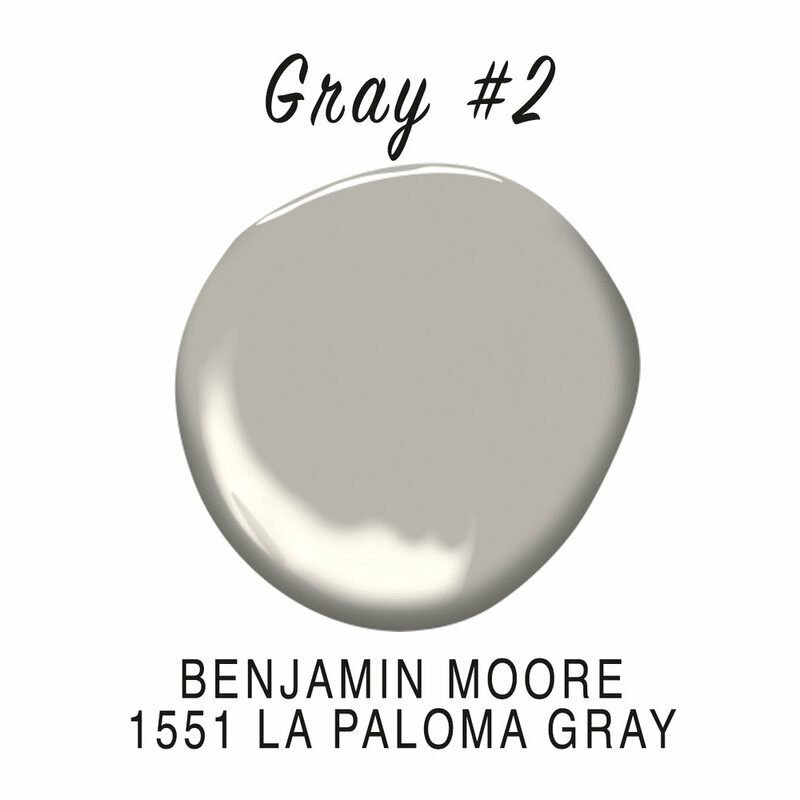 La Paloma Gray is similar to Coventry Gray in that it is also a mid-tone gray. However, when compared side-by-side, it has a much warmer undertone to it. While Coventry Gray has a crisp, contemporary look, La Paloma Gray has a touch more sophistication. Here, you can see La Paloma Gray paired with the dark Kendall Charcoal shiplap around the windows. Because both have warm undertones, they pair together beautifully. The strip of wall on the left is La Paloma Gray. You can see how the warm undertones pair perfectly with the warm stain on the window mullions. La Paloma Gray is beautiful when used in a kitchen - especially one as detailed and sophisticated as this one. This space is the perfect example of how La Paloma Gray can be used in a purely neutral way. When paired with the warm tones of the stone and the stained trim, the walls simply disappear and allow the rest of the room to be the focal point. 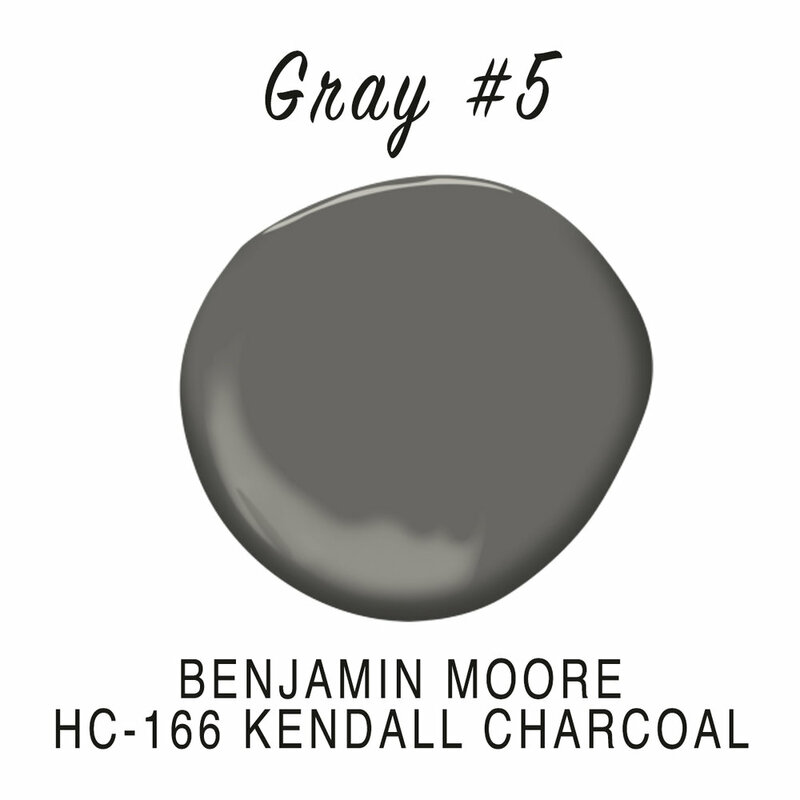 Chelsea Gray is one of my biggest go-to gray’s when I want a bold contrast without it feeling too dark. It can have a slight green undertone in certain light, so be sure to double check this one in the room you plan to paint it in and make sure your light bulbs aren’t casting too warm of a light. Don’t be afraid to use a bold color like Chelsea Gray on trim or cabinetry! Here again, it’s shown on trim and cabinetry. I love the contrast of Chelsea Gray against a bright white. Chelsea Gray is a gorgeous choice for the exterior of a home. Paired with white trim, it allows the architectural details to shine. 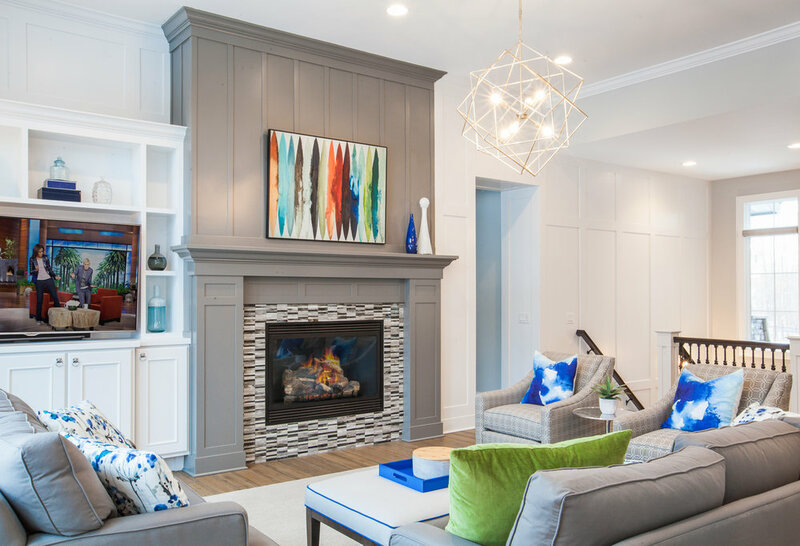 Here, the Chelsea Gray fireplace allows it to pop in this white room and while it’s bold, it doesn’t feel too heavy in the room. Stonington Gray is a very subtle, light and airy gray. I like using this color in spaces that I want to feel bright and crisp. I’ve even used it on ceilings before! Stongington Gray can pair beautifully with pops of pastel colors like coral. Here, the walls were a textured white pattern, so I used Stongington Gray on the ceiling to make the crown molding pop and give the room some contrast. Spotted in the background? A Chelsea Gray door! You can start to see how much I recycle these 5 favorite colors! Stongington Gray is the perfect shade of gray for a room that doesn’t have a window in it. Last, but certainly not least, the gray with the boldest punch of them all! Kendall Charcoal is the perfect choice for any space where you want to create contrast and drama. It pairs well with cooler colors and warmer colors, but it’s just light enough that it doesn’t feel black. I’ve used Kendall Charcoal over, and over, and over again. Here, you can see how the Kendall Charcoal trim and cabinetry pairs beautifully with the knotty alder shiplap and the pinstripe wallpaper. It can easily create a masculine feeling in any space. Remember this photo? That’s Kendall Charcoal shiplap around the window and the window mullions are also painted Kendall charcoal with white trim for bold contrast. This space is the perfect example of how Kendall Charcoal doesn’t just have to be used in a masculine room. Kendall Charcoal works perfectly with any style. Shown here, it’s featured in a contemporary home gym on an accent wall and on the ceiling. Paired with it on the walls in the background? La Paloma Gray! These are my Top 5 Gray Paint Colors! There’s a lot of paint colors out there, but I go to these 5 time and time again. What’s your favorite gray paint color? Older PostOur Laundry Room Was SO BAD!